276 pages | 2 B/W Illus. ‘Ideologies need enemies to thrive, religion does not’. 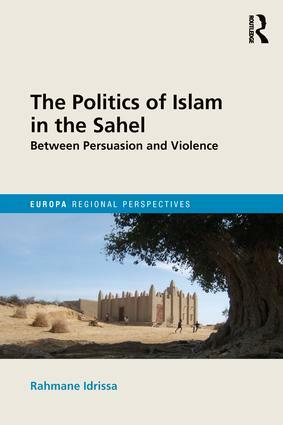 Using the Sahel as a source of five comparative case studies, this volume aims to engage in the painstaking task of disentangling Islam from the political ideologies that have issued from its theologies to fight for governmental power and the transformation of society. While these ideologies tap into sources of religious legitimacy, the author shows that they are fundamentally secular or temporal enterprises, defined by confrontation with other political ideologies–both progressive and liberal–within the arena of nation states. Their objectives are the same as these other ideologies, i.e., to harness political power for changing national societies, and they resort to various methods of persuasion, until they break down into violence. The two driving questions of the book are, whence come these ideologies, and why do they–sometimes–result in violence? Ideologies of Salafi radicalism are at work in the five countries of the Sahel region, Burkina Faso, Mali, Niger, (Northern) Nigeria and Senegal, but violence has broken out only in Mali and Northern Nigeria. Using a theoretical framework of ideological development and methods of historical analysis, Idrissa traces the emergence of Salafi radicalism in each of these countries as a spark ignited by the shock between concurrent processes of Islamization and colonization in the 1940s. However, while the spark eventually ignited a blaze in Mali and Nigeria, it has only led to milder political heat in Niger and Senegal and has had no burning effect at all in Burkina Faso. By meticulously examining the development of Salafi radicalism ideologies over time in connection with developments in national politics in each of the countries, Idrissa arrives at compelling conclusions about these divergent outcomes. Given the many similarities between the countries studied, these divergences show, in particular, that history, the behaviour of state leaders and national sociologies matter–against assumptions of ‘natural’ contradictions between religion (Islam) and secularism or democracy. This volume offers a new perspective in discussions on ideology, which remains–as is shown here–the independent variable of many key contemporary political processes, either hidden in plain sight or disguised in a religious garb. Rahmane Idrissa is a Nigerien political scientist, and is a research fellow at the Society, Work and Development Institute of the University of the Witwatersrand, South Africa, and at the Institute for Social and Cultural Anthropology of the University of Göttingen, Germany. He has previously co-authored the Historical Dictionary of Niger and L’Afrique pour les nuls (‘Africa for Dummies’).